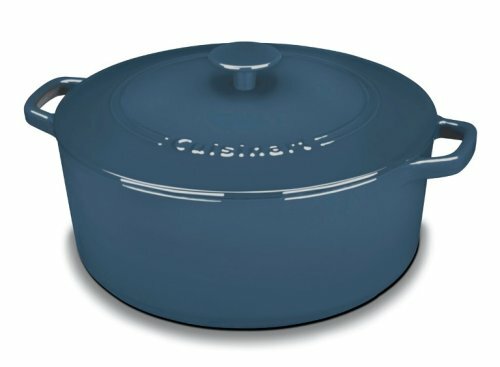 Cast iron improves its solid reputation with Cuisinart Chef's Classic Enameled Cast Iron Cookware! Cast iron is recognized as one of the best materials for cooking because of its ability to retain heat and provide even heat distribution. This type of cookware is widely used for almost any recipe from roasts to desserts and performs well with a variety of cooking methods from searing to simmering. May pan styles are available for cooking soups, sauces, casseroles, grills quiches, breads, and etc. These versatile pieces yield great results whether it's on the stove or in the broiler or oven. They can go to table and double as elegant serving pieces! Savor the Good Life right at home, with family and friends. Cuisinart makes it absolutely delicious. Porcelain enameled exterior both durable finish land rich in colors complements any kitchen decor. Cast iron contraction retains heat well. The porcelain enameled interior is perfect for cooking: surfaces do not impact flavors or absorb odors. Wide cast iron handles provide a comfortable and secure grip. Easy transport for serving. Oven safe knob for a durable grip and endless cooking options. Stovetop, oven and broiler safe. Induction stovetop compatible. Cast Iron construction provides superior heat retention and even heat distribution. Strong, durable finish in rich colors complements any kitchen decor. Perfect for cooking, serving and entertaining. Porcelain enameled exterior both durable finish land rich in colors complements any kitchen décor. Cast iron contraction retains heat well. The porcelain enameled interior is perfect for cooking: surfaces do not impact flavors or absorb odors. Strong, durable finish in rich colors complements any kitchen décor. Perfect for cooking, serving and entertaining.